Twitter is great for everyone. For businesses, it provides a way of communicating with customers, advertising and building a reputation. For normal people, it’s a way to keep in touch with the people you care about most be it your friends, family, celebrities, groups or businesses. There is the question though if there is a point on Twitter. A point where you can’t use Twitter any more to your advantage. 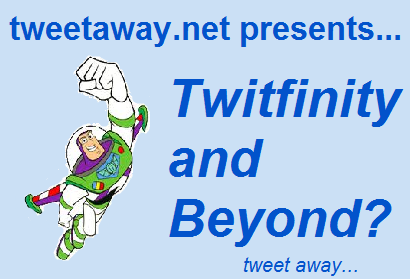 Or does like Buzz Light year, Twitter goes ‘to infinity and beyond’? This question of Twitter having limits came when I was checking out some celebrities stats on twittercounter.com. The majority of the top 100 followed users are on the increase of followers constantly but there must be a time where this constant growth stops? If it carries on like this, by the year 2050 Lady Gaga will have a 100 million folllowers: more than the population of the United Kingdom! You may be thinking I’m talking rubbish and you have every right to think that. The stats show everyone is getting more followers. What I’m saying is there must be a time where the constant follower growth stops. A time where everyone who likes Lady Gaga has finally followed her causing her follower growth to stop. This is a huge example of what my article is about today. For the every day person or business, Twitter has limits. A lot can be achieved with Twitter but not everything can be achieved. I guess this could mean that you can’t rely fuller on Twitter for personal reasons or business: it is not the answer to all. Now to stop the slating of Twitter, I’ll tell you Twitter although has limits has huge potential at the same time. Hit that niche in Twitter can make you extremely popular or successful.